At the completion of the First World War, American president Woodrow Wilson argued for fair treatment of Germany by the Allied Powers. Wilson believed that a League of Nations was needed to prevent future wars. However, France and England wanted vengeance. The resulting Treaty of Versailles imposed terrible hardships on Germany. The treaty stripped Germany of its overseas colonies and its coal-rich Saar region. Germany was limited to a small army and was forbidden to build large ships. The treaty also forced Germany to pay Great Britain and France for the damage caused by the war. The German people were quite proud, but they were in no position to oppose the terms dictated by England and France. Life for the German people became very difficult after the Treaty of Versailles. Germany was forced to borrow vast sums of money from America in order to pay its war debt to England and France. In 1929, the United States experienced an economic depression. A depression is a time when business is bad and many people are out of work. America was unable to continue lending money to Germany during the depression. Without the income from American loans, Germany was unable to pay its war reparations to England and France. The result was a severe depression in Germany. German money became close to worthless. The German people were angry with the Treaty of Versailles; they felt the terms were unfair. Many Germans believed a strong leader could return their nation to greatness. Hitler spoke in a charismatic style that impressed the German people. He blamed outsiders for causing problems in the nation. He argued that if pure Germans known as Aryans controlled the destiny of Germany, it would return to greatness. Hitler placed the blame for many of Germany’s problems on one group: the Jews. By January 1933, Hitler and his National Socialist (Nazi) party controlled Germany. Hitler became a dictator, a leader with complete control. The Nazis acted quickly against all who opposed their rule. They outlawed all other political parties. People who opposed the new regime were often murdered. The Nazis focused on teenagers and trained them to follow Hitler’s beliefs. The Boy Scouts and other teenage organizations were outlawed. Teens were encouraged to join the “Hitler Youth,” where they chanted Nazi slogans and were taught that they had the power to fulfill Germany’s destiny as a world power. 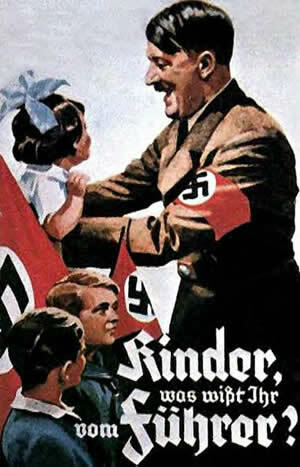 Adolf Hitler (1889 – 1945) was the leader of the Nazi Party in Germany. He was chancellor of Germany from 1933 to 1945 and Führer of Nazi Germany from 1934 to 1945. To pay for the costs of the First World War, German borrowed heaving from other nations. 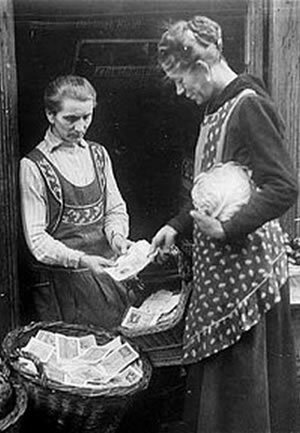 As a result, Germany experienced a period of hyperinflation as their money lost its value. Baskets of money had to be exchanged for everyday expenses and poverty increased throughout the already poor nation.